The pictures below are all new, they are a bit different from anything I have done with wax before as they have words printed ……. I love some of the shabby chic style artwork and accessories that are around at the moment, and these paintings are inspired, albeit just slightly by some of the shabby chic things I like. I think, to say something is shabby chic, covers many styles so I say these are inspired by rather than anything else. I started by printing onto my encaustic gloss card, the words that you can see in black below, I then covered the ink from the words in clear wax. A technique used in encaustic art when using stamps, I haven’t used stamps in my artwork but I understand this to be the technique. I then created the backgrounds of the paintings, using pearl cream wax and gold wax, adding a little coloured wax here and there, the backgrounds are therefore not a solid colours and the gold hints shine through giving a glint in the light. Some of the background wax covers the words in places giving a rustic look I feel. 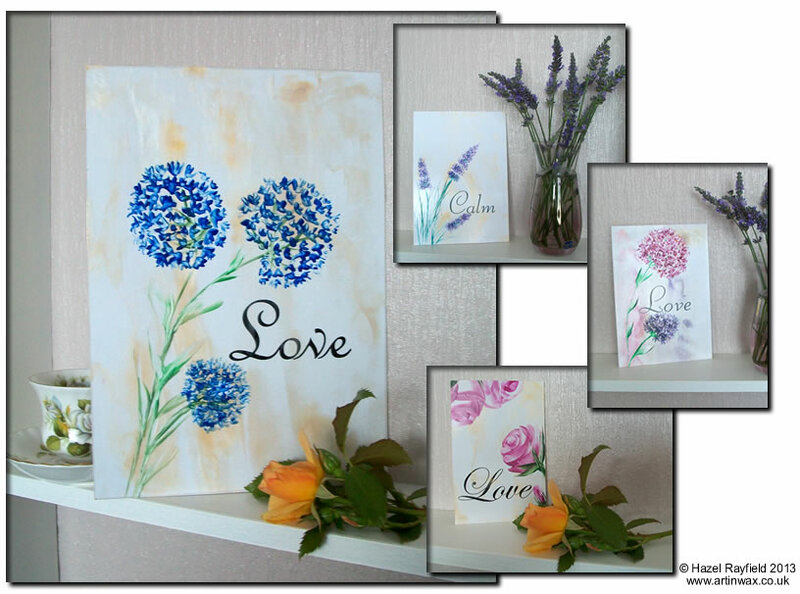 The artwork above shows four paintings, the blue flowers and the Love is an A4 piece, with the Calm lavender and the Love pink and blue flowers are A5 and the Pink Roses Love is smaller at A6. These paintings are for sale ……. contact me if you would to find out how to purchase them.